The Big Durian is the nickname lovingly bestowed to Indonesia’s largest city, Jakarta. I had no idea what to expect from this city, but I do know one thing: I love durian. Of course the moniker is really referencing Jakarta’s stinky and rough qualities but I prefer to think of the city in regards to durian’s charming characteristics: sweet and creamy. I wasn’t going to look for the off-putting notes, rather focus on the delicious ones. Just like durian, if you can get past the smell, there’s a wonderful world behind those spiky thorns! Jakarta is big. Sixteen million people big. The streets are never without traffic (well, around 10 pm it starts to die down) and the sidewalks are never without loungers and food carts. I’m a major fan of street food, so I took the opportunity to peek into every cart that I walked past. That usually elicited “welcomes” and “hellos” and lots of laughter. I stopped a few times to grab a meal from a street vendor. I adore eating this way in Thailand (and anywhere else in the world that offers street fare) and I wanted to taste Indonesian roadside offerings. But the food here proves to be less exciting than Indonesia’s neighbors to the north. The food is heavy in carbohydrates (rice and noodles are staples) and much of it is fried. 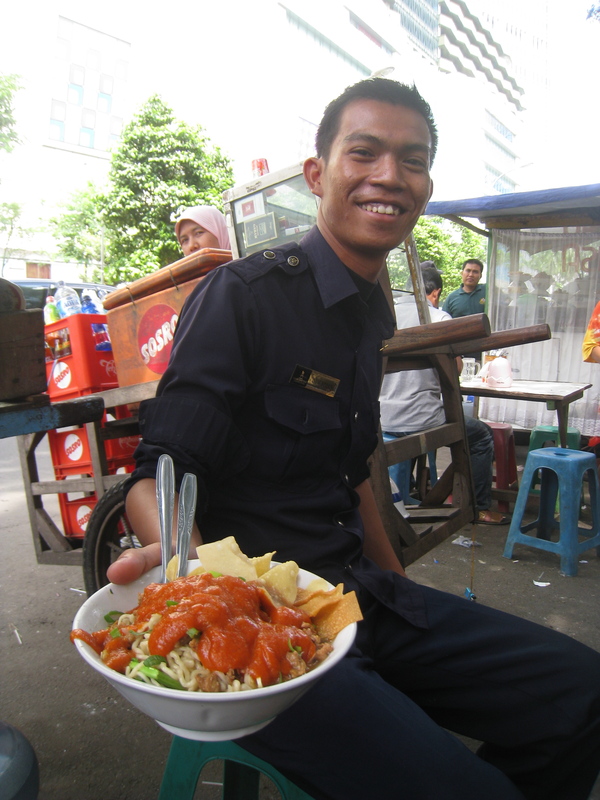 Nasi goreng (nasi means rice and goreng means fried) is an item that can be found on every corner. Actually, you will find that most things are goreng’ed. Fried noodles, fried tempeh, fried chicken, fried shallots…frying is a common means of cooking. On top of that, a common ingredient is peanut butter. It’s added to noodles as a sauce, and satays (different parts of beef or chicken on a skewer) are generously dipped in it. 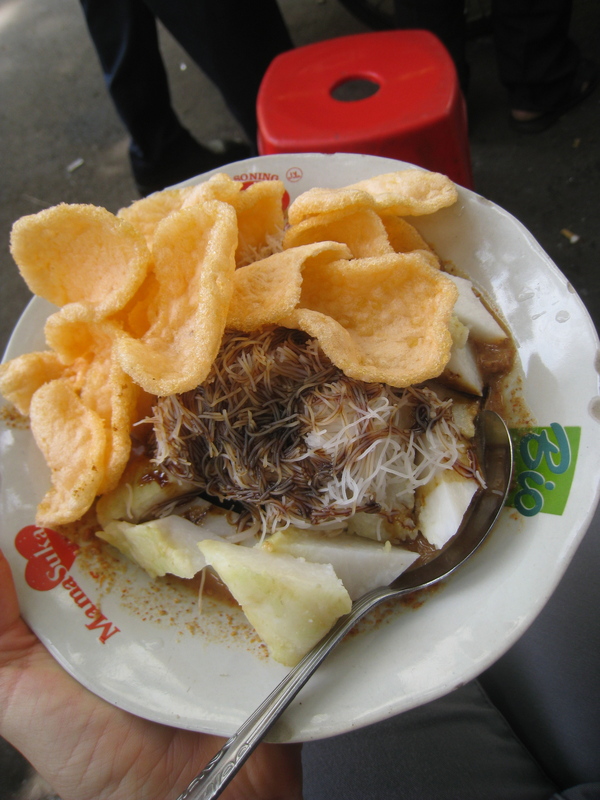 Sweet, heavy and fried is how the Jakartans seem to like their meals. The food doesn’t sit light here. I tried to find something a touch more refreshing to nibble on, but that seemed really to only exist in the fresh fruit juices you can get off the streets. There’s not much variety in the cuisine, and the food really lacks acidity. A tiny punch is only delivered in mild chili doses. Jakarta does have good food available, but I’m not sure if the best of it is represented in the street. 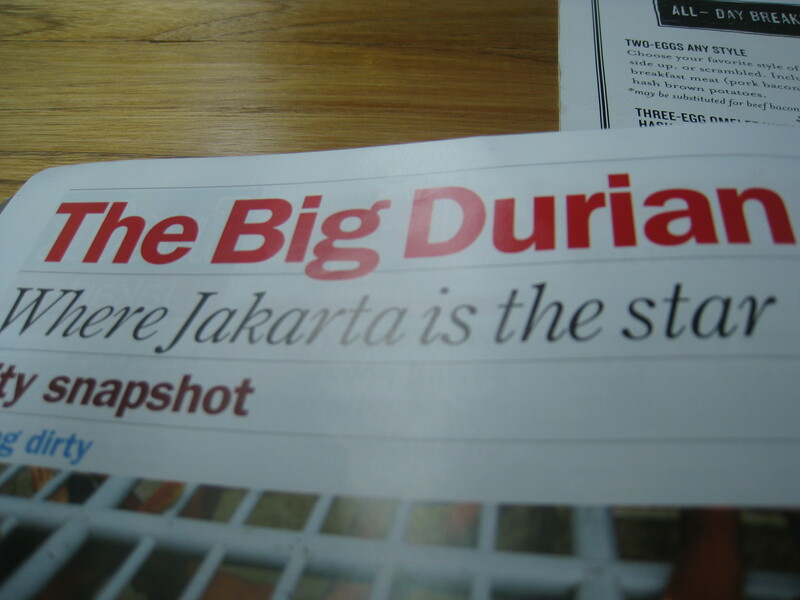 So maybe Jakarta didn’t prove to be made up of my durian dreams. No matter. Getting past the thorns is part of the fun. So the food isn’t Thai food…nor is it Vietnamese. What it lacks in herbs and freshness it makes up for in character. Friendly Javanese people who make sweet peanut buttery foods isn’t the worst combination in the world. It’s still a fun experience to dine street side though, and eating on a wobbly plastic stool with some locals is quite enjoyable. 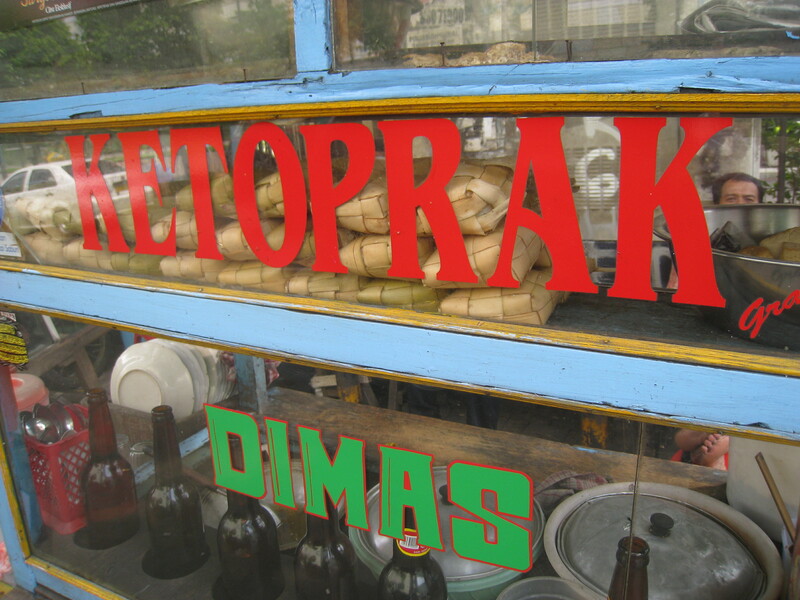 And for less than a dollar and a tummy full of gooey, savory and sweet ketoprak, why not give it a go? moto taxis = negotiable, but most places in the city are accessible for 40,000 Rupiah or less.